A spiritual guide to positive change. 9 Indian languages and 8 foreign languages. 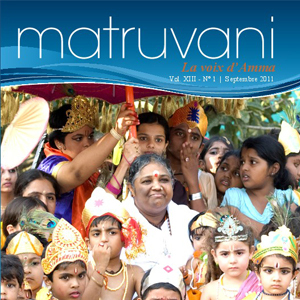 Choose a Matruvani issue to Read. Checkout the editions in any language you choose. 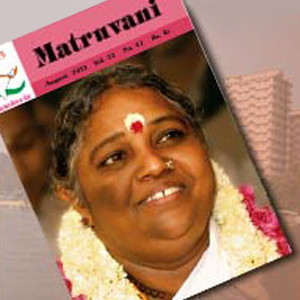 Sri Mata Amritanandamayi Devi, devoutly hailed throughout the world as ‘Amma’ (‘Mother’), is spiritual guide to millions throughout the world. Her darshan, during which She consoles and counsels people, exemplifies Her central teaching of loving and serving all unconditionally. As Amma says, “My life is my message.” Through Her personal example and the simplicity of Her words, She dispenses the manna of timeless and universal spiritual wisdom to people from all corners or the world and all walks of life. 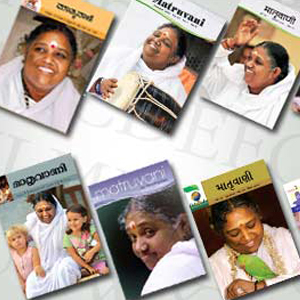 Her renunciation and self-sacrifice has inspired an extensive network of charitable works that include disaster relief, healthcare for the poor, women empowerment programs, vocational training, providing homes for the destitute and care homes for children, scholarships for students from economically challenged backgrounds, and green initiatives. The Math manages a five-campus university, Amrita Vishwa Vidyapeetham, which in partnership with the best universities around the world, is undertaking research for the benefit of society and providing value-based education to all. A network of Amrita Vidyalayam schools all over the country provides students with exposure to India's rich and ancient culture.